So, everyone was all "Isn't it crazy that Nate is TWO?" and "I can't believe it! He's so old!" and I was all "Yea. I know. Clearly." Turning two seemed solid. No big deal. All those things I thought we be done by two (potty training, bedtime paci removal), I thought psssshaw, no rush, he's just two. He's still my sweet little boy. 1. I picked up Nate's registration packet for 'school' this fall. (He's going on Tuesdays and Thursdays and I will most likely be working part time for a bit...more on that later.) I opened it this weekend and amongst the thousands of forms (Yes, you can put sunscreen on my kid. Yes, he can have juice.) there were two that made me pause. Right behind that, tucked in the back all innocent-like was a big paper with a number on it. For my car window. FOR THE CARPOOL LINE. (I know, I started breathing into a brown paper bag when I read it too.) I remember when I started taking Nate to school and how super envious of the carpool line I was. How nice, I thought... they don't even have to get out of their cars. And now? Well, now I think ARE YOU KIDDING ME? He's way too young, I need to walk him in myself and kiss him bye and, dear God, he's going to SCREAM BLOODY MURDER! Ahhhhh my first time parenting worries OUT IN FULL EFFECT!! 2. We had Nate's two year doctor appointment on Friday. The appointment was great (Well, great if you think Nate screaming through the whole thing like an infant is as amazing as I do. He hates the stupid thermometer under the armpit and it's all downhill from there. Not frustrating AT ALL, I swear. Additionally, I think he might remember the poking and prodding and chest x-rays from last visit, because he started in with the "go home mommy" the minute we got off the elevator. Sigh.) Well, hopefully he'll lose that fear because he doesn't have to go back UNTIL HE IS THREE. (If you haven't gotten it already, this is the fact that freaked me out.) THREE YEARS OLD. A WHOLE YEAR AWAY. A whole year of crazy development I might add. I mean, they're supposed to go every few months for a progress check, right?! I mean how am I supposed to know what percentile he's in for god's sake?!?! And. One final note for this post. It doesn't really fit with the whole THEME of this post (you know the whole me FREAKING OUT about ridiculous things theme? What? You didn't get that?) but it was too funny not to share. At all of Nate's well visits, the patients get a book (It's part of a program to encourage reading to your babes. Hooray!) He's gotten some cute ones, and, after crying through his whole appointment yesterday THIS is the book the nurse hands me. Fuuny. Appropriate book. And it totally is bc the whole chest xray last time. Nash was the same way the next appt back from that horrible appt. And I totally feel you on this entire post.Just glad we are going through it together. Helps more than you know. 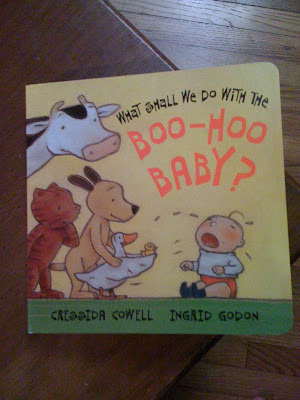 hahaha hilarious about the book... :) And this whole thing is hilarious! 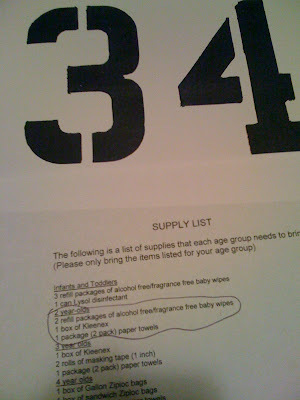 The carpool line and supply list=I adore you. I gots news for you- parenting never gets better. For now, 5 seems like a far cry from 2, but just you wait until the day Nateypants pours his own cereal, pours the milk, gets a spoon, eats it all up, and calls out "Momma, do you want me to fix you breakfast?" You. Will. Die. because that baby is now just a very short adult. hilarious. 2 is still definitely a baby. think of all the paper towels and kleenex you go through. The carpool thing is a little sketch though. ack! you're making me hyperventilate about MY daughter heading to preschool in the fall now...and she'll be three! I totally feel ya.